The Double Duplex infill project is located on Melbourne Avenue in Parkdale, one of Toronto’s most notable historic neighbourhoods for their century old Victorian and Bay and Gable mansions. The existing double wide site was severed into two separate properties with a four storey 3,500 square foot detached duplex residence being constructed on each site, allowing property owners to either rent out one of the units to subsidize their own income or to use it as a live work space. Many of the 19th Century mansions, often later converted to rooming houses still exist and are being converted back into single family homes. The unique Parkdale neighbourhood now finds itself home to a large burgeoning artist community. Double Duplex pays tribute to the existing context and the beauty of its craft and local artistry by making contextual relationships through massing and geometry along with texture and detail of paramount concern. Instead of trying to replicate the 19th century means and methods of craft we ask how can we contemporize and reinterpret the existing condition? The Double Duplex massing emerges as a contemporary response to its context, using an abstraction of the pervasive Bay and Gable typology the project becomes a reinterpretation of key architectural elements. These elements include the large bay massing that usually covered over half of the front elevation, the steep roofs and sharp vertical lines, the front balcony, high ceilings with large windows which allowed light to reach the depths of the narrow floor plates, and elaborately decorated ornamentation in the form of motifs, mouldings and Brick Expressionism to create rich and textural facades. The Double Duplex geometry registers datum’s of adjacent neighbours window and door opening heights, roof slopes and eave heights, and material transitions on either side producing specific formal relationships. By leveraging digital fabrication techniques and use of new material technologies for perceptual, spatial and formal effect we translate the notion of 19th century craft by way of a two story brise soleil. The brise soleil encloses the front and rear balconies, allowing for controlled lighting conditions and privacy. Constructed of a bio-enhanced, rot resistant and sustainable softwood the individual pieces are organized to create a large scale dynamic facade. During the day the light is filtered and illuminates the interior spaces with ephemeral dappled light effects. And at night the screen reads as a decorative glowing lantern. The project also represents strategies for dynamic and spatial integration of exterior and interior spaces within a typical narrow and deep Toronto infill lot. Each duplex residence consists of a two storey lower unit and a two story upper unit. 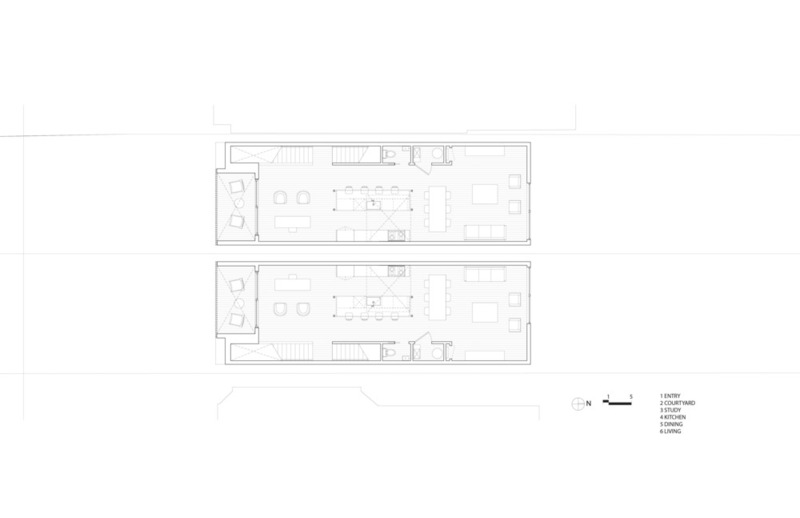 The lower unit is carved out in the front and back with double height volumes that flow out to sunken courtyards maximizing the amount of natural daylight entering the unit and transgressing the basement apartment stereotype. The lower unit’s courtyards are wrapped in brightly painted murals by local artists. The upper unit is organized around a double height atrium space which brings natural light and ventilation into the center of the unit. Two exterior courtyards punctuate either end of the floor plate behind the wooden brise soleil, to the front a double height balcony overlooks the street and to the rear provides for a master bedroom terrace.